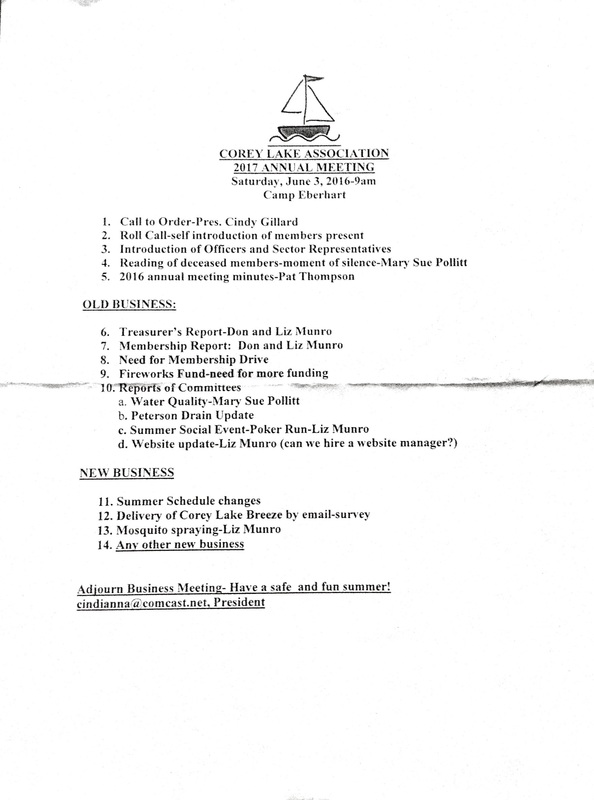 Our Annual Corey Lake Association Meeting for 2019 will be graciously hosted by Y.M.C.A. Camp Eberhart on Saturday, June 1, 2019 in Dave’s House. It will begin at 9:30am and we will shoot for no later than 11:30am to wrap things up. Important Note: During our Annual Meeting Camp will also hosting be a children’s bereavement camp throughout the grounds. Please be accordingly respectful while visiting for our meeting. Directions: Enter into Camp using main entrance (Camp Eberhart Drive), when you come to the “tee in road” (lots of directional signs here) there will be signs posted to help everyone navigate. Please mark your calendars and plan on joining in!